If you've been reading this far (or you've just dipped into this blog), you'll probably already know how to format a form. This page shows you how to make sure that short-cut keys, and the Enter, Tab and Cancel keys work as you would wish for a form. What will happen when you press Tab? 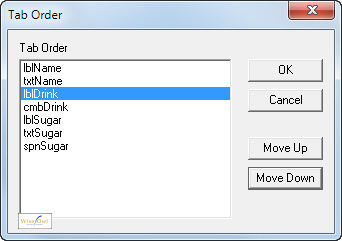 You want the cursor to jump to the next control which can "receive focus" - that is, the Drink: combobox. 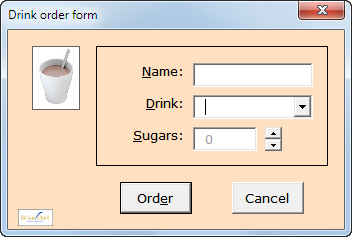 Either select the form itself, or a Frame or MultiPage control on it, then select to change the tab order as shown. Because you have a frame selected, you can change the tab order of the controls within the frame only. It may seem odd that the tab order includes labels, when these can't receive the focus (you can't click on them) and hence are nothing to do with tab order. 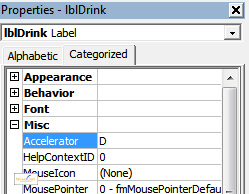 Read on to find out how accelerator keys require labels to appear in the Tab Order dialog box. The underlined letter D is called an accelerator key. You can only attach accelerator keys to labels, not textboxes or comboboxes. 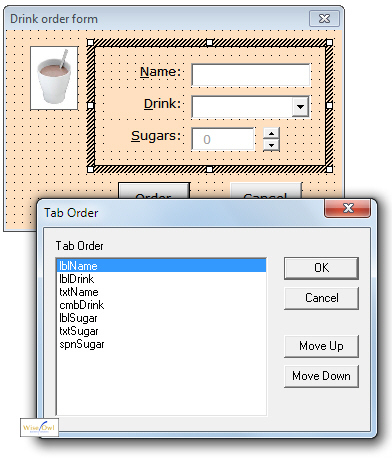 What will happen when you press ALT + D for the above example is that the cursor will jump to the next control which can receive the focus following the Drink combobox in the tab order. The reason that you will go to the Drink: combobox above is that it is the first control after the lblDrink label which can receive focus (ie which you can click in). Just type in a letter for the oddly-named Accelerator property . Here the Order button has a slighly darker border, and is the one which will be chosen if you press Enter. 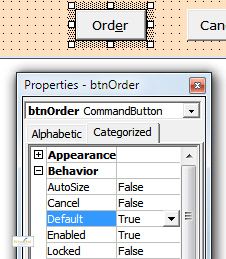 Select the Order button for our example, and set the Default property to True. Note that you can only have one default button on a form - so if you make another button the default, this will deselect this one. 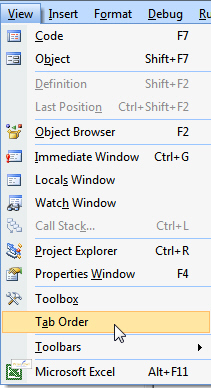 Similar to the Default button above, the Cancel button is the one that Windows will choose when you press ESC. 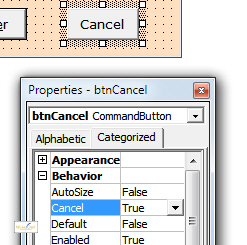 Select the Cancel button, and set its Cancel property to True. When a user presses ESC, this will then run any code attached to this button. Just like for the Default button, you can only have one Cancel button per form. These, however, are the subject of separate blogs.